New building regulations – the Building Control (Amendment) Regulations 2014 (SI no 9 of 2014) – were signed by the Minister for the Environment on 15 January and came into operation on 1 March 2014. The regulations apply to any development where a commencement notice is filed after 1 March 2014. They were followed by the Building Control (Amendment) (No 2) Regulations 2014 (SI no 105 of 2014), signed on 28 February 2014. The latter are of limited application, relating only to buildings intended for use in first, second, or third-level education or hospitals or primary care centres. All the following refers to SI no 9 of 2014. 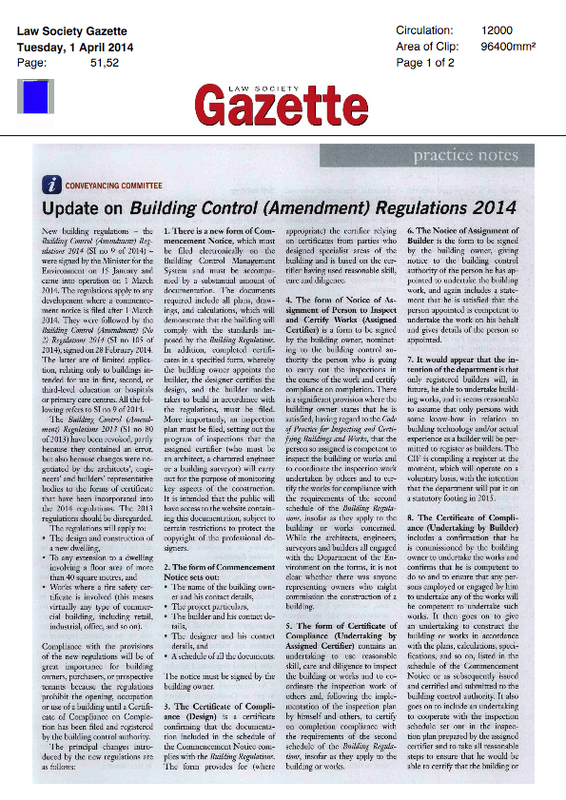 The Building Control (Amendment) Regulations 2013 (SI no 80 of 2013) have been revoked, partly because they contained an error, but also because changes were negotiated by the architects’, engineers’ and builders’ representative bodies to the forms of certificate that have been incorporated into the 2014 regulations. The 2013 regulations should be disregarded. Works where a fire safety certificate is involved (this means virtually any type of commercial building, including retail, industrial, office, and so on). Compliance with the provisions of the new regulations will be of great importance for building owners, purchasers, or prospective tenants because the regulations prohibit the opening, occupation or use of a building until a Certificate of Compliance on Completion has been filed and registered by the building control authority. 1. There is a new form of Commencement Notice, which must be filed electronically on the Building Control Management System and must be accompanied by a substantial amount of documentation. The documents required include all plans, drawings, and calculations, which will demonstrate that the building will comply with the standards imposed by the Building Regulations. In addition, completed certificates in a specified form, whereby the building owner appoints the builder, the designer certifies the design, and the builder undertakes to build in accordance with the regulations, must be filed. More importantly, an inspection plan must be filed, setting out the program of inspections that the assigned certifier (who must be an architect, a chartered engineer or a building surveyor) will carry out for the purpose of monitoring key aspects of the construction. It is intended that the public will have access to the website containing this documentation, subject to certain restrictions to protect the copyright of the professional designers. A schedule of all the documents. The notice must be signed by the building owner. 3. The Certificate of Compliance (Design) is a certificate confirming that the documentation included in the schedule of the Commencement Notice complies with the Building Regulations. The form provides for (where appropriate) the certifier relying on certificates from parties who designed specialist areas of the building and is based on the certifier having used reasonable skill, care and diligence. 4. The form of Notice of Assignment of Person to Inspect and Certify Works (Assigned Certifier) is a form to be signed by the building owner, nominating to the building control authority the person who is going to carry out the inspections in the course of the work and certify compliance on completion. 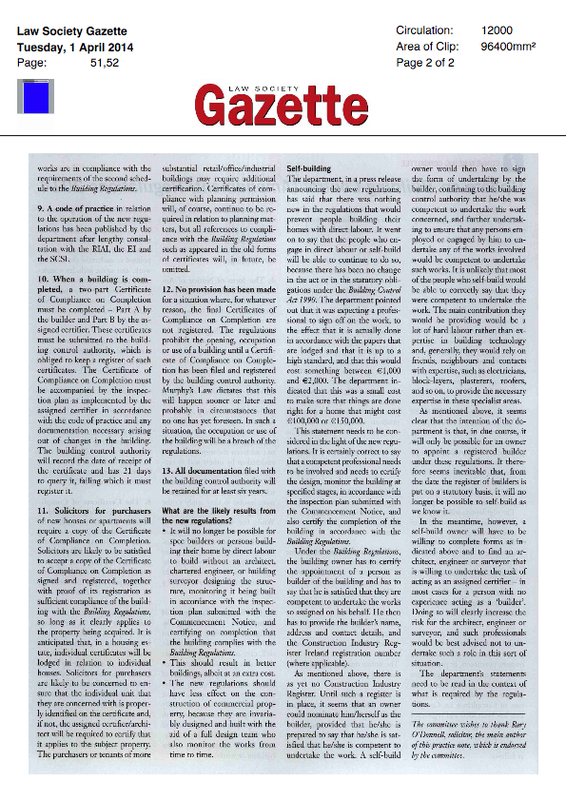 There is a significant provision where the building owner states that he is satisfied, having regard to the Code of Practice for Inspecting and Certifying Buildings and Works, that the person so assigned is competent to inspect the building or works and to coordinate the inspection work undertaken by others and to certify the works for compliance with the requirements of the second schedule of the Building Regulations, insofar as they apply to the building or works concerned. While the architects, engineers, surveyors and builders all engaged with the Department of the Environment on the forms, it is not clear whether there was anyone representing owners who might commission the construction of a building. 5. The form of Certificate of Compliance (Undertaking by Assigned Certifier) contains an undertaking to use reasonable skill, care and diligence to inspect the building or works and to coordinate the inspection work of others and, following the implementation of the inspection plan by himself and others, to certify on completion compliance with the requirements of the second schedule of the Building Regulations, insofar as they apply to the building or works. 6. The Notice of Assignment of Builder is the form to be signed by the building owner, giving notice to the building control authority of the person he has appointed to undertake the building work, and again includes a statement that he is satisfied that the person appointed is competent to undertake the work on his behalf and gives details of the person so appointed. 7. It would appear that the intention of the department is that only registered builders will, in future, be able to undertake building works, and it seems reasonable to assume that only persons with some know-how in relation to building technology and/or actual experience as a builder will be permitted to register as builders. The CIF is compiling a register at the moment, which will operate on a voluntary basis, with the intention that the department will put it on a statutory footing in 2015. 8. The Certificate of Compliance (Undertaking by Builder) includes a confirmation that he is commissioned by the building owner to undertake the works and confirms that he is competent to do so and to ensure that any persons employed or engaged by him to undertake any of the works will be competent to undertake such works. It then goes on to give an undertaking to construct the building or works in accordance with the plans, calculations, specifications, and so on., listed in the schedule of the Commencement Notice or as subsequently issued and certified and submitted to the building control authority. It also goes on to include an undertaking to cooperate with the inspection schedule set out in the inspection plan prepared by the assigned certifier and to take all reasonable steps to ensure that he would be able to certify that the building or works are in compliance with the requirements of the second schedule to the Building Regulations. 9. A code of practice in relation to the operation of the new regulations has been published by the department after lengthy consultation with the RIAI, the EI and the SCSI. 10. When a building is completed, a two-part Certificate of Compliance on Completion must be completed – Part A by the builder and Part B by the assigned certifier. These certificates must be submitted to the building control authority, which is obliged to keep a register of such certificates. The Certificate of Compliance on Completion must be accompanied by the inspection plan as implemented by the assigned certifier in accordance with the code of practice and any documentation necessary arising out of changes in the building. The building control authority will record the date of receipt of the certificate and has 21 days to query it, failing which it must register it. 11. Solicitors for purchasers of new houses or apartments will require a copy of the Certificate of Compliance on Completion. Solicitors are likely to be satisfied to accept a copy of the Certificate of Compliance on Completion as signed and registered, together with proof of its registration as sufficient compliance of the building with the Building Regulations, so long as it clearly applies to the property being acquired. It is anticipated that, in a housing estate, individual certificates will be lodged in relation to individual houses. Solicitors for purchasers are likely to be concerned to ensure that the individual unit that they are concerned with is properly identified on the certificate and, if not, the assigned certifier/architect will be required to certify that it applies to the subject property. The purchasers or tenants of more substantial retail/office/industrial buildings may require additional certification. Certificates of compliance with planning permission will, of course, continue to be required in relation to planning matters, but all references to compliance with the Building Regulations such as appeared in the old forms of certificates will, in future, be omitted. 12. No provision has been made for a situation where, for whatever reason, the final Certificates of Compliance on Completion are not registered. The regulations prohibit the opening, occupation or use of a building until a Certificate of Compliance on Completion has been filed and registered by the building control authority. Murphy’s Law dictates that this will happen sooner or later and probably in circumstances that no one has yet foreseen. In such a situation, the occupation or use of the building will be a breach of the regulations. 13. All documentation filed with the building control authority will be retained for at least six years. What are the likely results from the new regulations? It will no longer be possible for spec builders or persons building their home by direct labour to build without an architect, chartered engineer, or building surveyor designing the structure, monitoring it being built in accordance with the inspection plan submitted with the Commencement Notice, and certifying on completion that the building complies with the Building Regulations. This should result in better buildings, albeit at an extra cost. The new regulations should have less effect on the construction of commercial property, because they are invariably designed and built with the aid of a full design team who also monitor the works from time to time. The department, in a press release announcing the new regulations, has said that there was nothing new in the regulations that would prevent people building their homes with direct labour. It went on to say that the people who engage in direct labour or self-build will be able to continue to do so, because there has been no change in the act or in the statutory obligations under the Building Control Act 1990. The department pointed out that it was expecting a professional to sign off on the work, to the effect that it is actually done in accordance with the papers that are lodged and that it is up to a high standard, and that this would cost something between €1,000 and €2,000. The department indicated that this was a small cost to make sure that things are done right for a home that might cost €100,000 or €150,000. This statement needs to be considered in the light of the new regulations. It is certainly correct to say that a competent professional needs to be involved and needs to certify the design, monitor the building at specified stages, in accordance with the inspection plan submitted with the Commencement Notice, and also certify the completion of the building in accordance with the Building Regulations. Under the Building Regulations, the building owner has to certify the appointment of a person as builder of the building and has to say that he is satisfied that they are competent to undertake the works so assigned on his behalf. He then has to provide the builder’s name, address and contact details, and the Construction Industry Register Ireland registration number (where applicable). As mentioned above, there is as yet no Construction Industry Register. Until such a register is in place, it seems that an owner could nominate him/herself as the builder, provided that he/she is prepared to say that he/she is satisfied that he/she is competent to undertake the work. A self-build owner would then have to sign the form of undertaking by the builder, confirming to the building control authority that he/she was competent to undertake the work concerned, and further undertaking to ensure that any persons employed or engaged by him to undertake any of the works involved would be competent to undertake such works. It is unlikely that most of the people who self-build would be able to correctly say that they were competent to undertake the work. The main contribution they would be providing would be a lot of hard labour rather than expertise in building technology and, generally, they would rely on friends, neighbours and contacts with expertise, such as electricians, block-layers, plasterers, roofers, and so on, to provide the necessary expertise in these specialist areas. As mentioned above, it seems clear that the intention of the department is that, in due course, it will only be possible for an owner to appoint a registered builder under these regulations. It therefore seems inevitable that, from the date the register of builders is put on a statutory basis, it will no longer be possible to self-build as we know it. In the meantime, however, a self-build owner will have to be willing to complete forms as indicated above and to find an architect, engineer or surveyor that is willing to undertake the task of acting as an assigned certifier – in most cases for a person with no experience acting as a ‘builder’. Doing so will clearly increase the risk for the architect, engineer or surveyor, and such professionals would be best advised not to undertake such a role in this sort of situation. The department’s statements need to be read in the context of what is required by the regulations. The committee wishes to thank Mr Rory O’Donnell, solicitor, the main author of this practice note, which is endorsed by the committee. 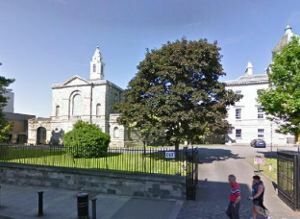 BC(A)R SI.9 and Law Society of Ireland?